Right now you can get this Fisher-Price Little People Take Turns Skyway ONLY $29.82 (Retail $42.99)! 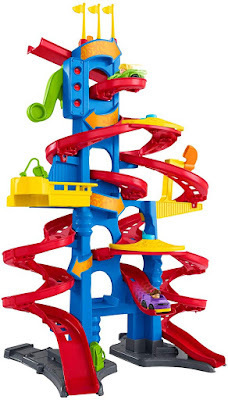 At over 3 feet tall, the Fisher-Price Little People Take Turns Skyway is the tallest Wheelies racetrack ever! With three different tracks, an awesome launcher, cool racing sounds and phrases, and pretend play stops along the way, this track set is loaded with awesome racing fun for toddlers to discover and share. Little things that make a big difference Taking Turns: As kids share the tracks, sending vehicles zooming down and around, they see that taking turns means more fun for everyone! Imaginative Play: With easy-to-grasp vehicles and pretend play stops like a gas &amp; repair station, toddlers can use their imaginations to create stories as they play. Fine Motor: Little hands get a big workout as they grasp the vehicles and send them zooming down the tracks.